Gina Francica and her wedding party gathered in the chapel post-ceremony. 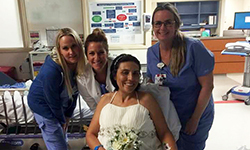 Gina Francica surrounded by some of the UF Health nurses responsible for her care and her wedding planning. A driver, who police say was texting while driving, ran through a red light and rear-ended their vehicle, changing their plans dramatically. Everything happened so quickly. After the initial shock of the crash, Francica pulled her daughter out of the car to safety and did not notice her own injuries. It took convincing by Jacksonville Fire and Rescue Department to get Francica into the ambulance and on the way to UF Health TraumaOne, the only adult and pediatric Level I trauma program in Northeast Florida and Southeast Georgia. Kelly McIntosh, BSN, RN, a nurse on duty in TraumaOne, viewed Francica’s condition as fair upon her admission. “She had what we refer to as paresthesia, which is numbness and tingling to the extremities, requiring her to stay in the trauma center,” McIntosh said. The team at UF Health Jacksonville was able to quickly reunite Francica and her daughter. However, it quickly became apparent she was facing more severe complications from the crash. Carolina Pereira, MD, an emergency medicine physician, ordered a CT scan, which identified abnormalities. A neurosurgeon was consulted and ordered an MRI to take a closer look at Francica’s spinal cord and assess her for further injury. Doctors caring for Francica delivered the news to her and her fiancé that she would require surgery and they should make the calls to inform guests about the wedding cancellation. It was a devastating realization for the couple. But McIntosh and Jessica Evitt, RN, were determined to lift the spirits of the couple and their family. They set the plan in motion with emergency room and progressive care unit staff — they were going to make the wedding happen. 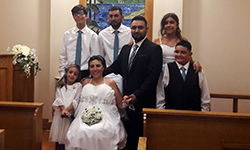 “Even though Gina was not going to get the traditional wedding she had planned for, our staff wanted to ensure she was going to have a day to cherish and remember,” Evitt said. The teams worked to gather supplies to decorate and enlisted Francica’s daughter and fiancé to bring the dress and contact wedding guests. In coordination hospital chaplain Jassan Saylon, Francica had the ceremony on her wedding day after all. Francica was transferred to a rehabilitation facility after her condition improved and she was well enough for transport. She went from not being able to move her legs from the waist down to where she is today — dancing, taking yoga classes and living life to the fullest.